In an effort to spite the United States, several Latin American nations issued a grant of asylum to the maligned Edward Snowden as getting a dig in on the USA is downright irresistible. Latin American countries with shaky US relations like Cuba, Venezuela, Nicaragua and Bolivia were Snowden’s original choices. Thanks to Glenn Greenwald and his band of merry ‘journalists’ who have drummed up outrage at the NSA’s PRISM program as an affront to privacy, Snowden is a man without a country. His passport now revoked, few countries will allow his passage over their airspace. Snowden, a man who took a job simply to steal National Security secrets, ironically said in 2009 leakers should be ‘shot in the balls’, expresses outrage at the information available at the spy organization’s fingertips. This is not a new development as the Patriot Act has allowed for surveillance since 9/11/2001. Proving he is far from logical and sensible, Snowden-Greenwald selected China, then Russia for safe-haven as if these nations are bastions of “freedom” who allow the unrestricted flow of information between the government and its citizens. Now, it seems Russia may be his last resort. Irony can be defined by placing one’s fate for asylum and compassion in the hands of the likes of Vladimir Putin. People who are claiming the NSA has violated their privacy rights are the very same individuals who also have a massive social media addiction and can have one or more of the following accounts: Facebook, Twitter, Linked In, Instagram, Vine, Google+, Pinterest and Tumblr. The self-anointing of Edward Snowden as a victim and de facto hero is as preposterous as George Zimmerman claiming he was attacked by an unarmed teen. Playing this card may work for a short time but public sentiments can change like the wind. 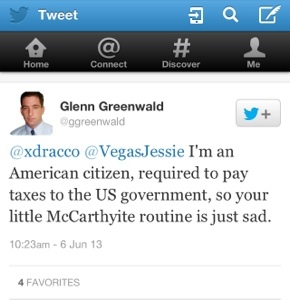 By the defensiveness of Glenn Greenwald on a myriad appearances and posts, it seems the jet stream is changing. Glenn Greenwald was a vocal supporter of the Iraq War and Bush’s “War on Terror.” He is a Civil Libertarian who stood with Rand Paul on protesting the domestic use of drones even though there has never been a domestic drone strike. His vitriolic tone and defensive demeanor often materialize on Twitter with personal attacks. This is his response to me after I simply asked why it is such an outrage the NSA, an intelligence gathering organization, utilizes metadata to determine whether covert, potentially hazardous plots may be forming against the American people. How this makes me a disciple of Joseph McCarthy eludes me completely. In his quest for relevancy and fame, he mercilessly self-promotes and stirs the pot, often offending prominent people far more distinguished and qualified than he. His continued need to be in the spotlight supersedes his so-called whistleblower intentions. It was never about the NSA. He exposed nothing new. This simply gives his President Obama-loathing a new forum and like he attempted in 2010, it gives him a platform to divide Progressives and keep his Cato Institute Koch Brothers bosses happy. His intent is to help Libertarian hypocrites, like Rand Paul, divide and conquer. Make no mistake. This man and his pawn Edward Snowden truly are no friends of Americans. In a time where voting rights have been gutted, vigilantes can legally hunt and kill unarmed black teens without penalty, women are viewed by state governments as breeders (comparable to livestock), poor children and elderly can literally starve while Wall Street is back to business as usual, America does not need distractions like this Snowden-Greenwald circus. Progressives, Democrats and like-minded, thinking and caring Americans need to unite to fix the evils caused by the far-right fringe lunatics who have taken over Congressional and state governments. To allow a slippery sophist trafficking in disingenuous outrage to direct the news cycle is downright detrimental to saving this country from the deranged, bigoted, racist theocracy the Republicans are working so hard to create. actually, a blogswerve that I almost agree with. VegasJessie you must be slipping!